NEW YORK - Fans of power rockers ALTER BRIDGE rushed to "beat the street" online this week and make Live At Wembley , the band's second live CD/DVD - and the first live concert DVD from The Dude Films - hit #2 in the Top 100 on the Blu Ray Music Videos & Concerts chart at Amazon.com, just beneath Adele. For the seventh day in a row, LIVE AT WEMBLEY, with a street date of March 26, 2012, has been in the Top 10 of Amazon Bestsellers in the Blu Ray Music Videos & Concerts chart, ahead of video offerings from other music giants in the Top 10 such as Iron Maiden, Whitney Houston and Tony Bennett. The title has consistently picked up sales and momentum since it was initially posted on Amazon over a week ago, showing the incredibly true loyalty and love of Alter Bridge fans. The band's previous live CD/DVD, LIVE FROM AMSTERDAM (2009), broke records at Amazon, rising 15,000 spots in one day to capture the #1 position. The package was very well received and garnered 4- and 5-star reviews across the board. 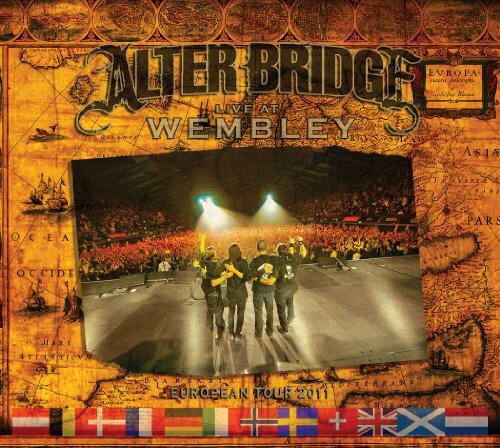 Live At Wembley , distributed in North America through EMI Label Services, includes every key Alter Bridge track from their three studio albums, including "Isolation," "Ghosts Of Days Gone By," "Wonderful Life," "Watch Over You," "Broken Wings," "Rise Today," "Open Your Eyes" and many more, and was captured in late November during the Fall 2011 European tour at the historic Wembley Arena. Directed by long time Alter Bridge Director Daniel E. Catullo III (Rush, Nickelback, Smashing Pumpkins, Godsmack) and produced by Catullo and Lionel Pasamonte, the 16-camera, state-of-the-art high definition shoot was filmed in front of a fanatical audience of over 10,000 English fans as the band gave the performance of a lifetime, captured in pristine audio visual perfection, in 5.1 DTS Surround Sound, at Wembley Arena in London. The Deluxe Edition of the DVD is set to include a second bonus disc of content shot specifically for this release, plus a 60-minute documentary called "The Road To Wembley" and photo gallery, and 16-page souvenir booklet. The Dude Films, LLC was formed in 2011 by Entrepreneur Stuart Margolis and is headquartered in Laguna Beach, CA. The Dude Films, LLC is a new multi-media company specializing in exclusive live concerts and behind-the-scenes content from multi-platinum artists to be distributed through multiple distribution channels, including the latest mobile and digital technology. The company recently signed a distribution deal in North America with EMI Label Services.